Tonight we leave behind our "Dude, That's So Gay" block of movies and begin four grueling nights of "Ugh, Let's Watch Julia Roberts." Perhaps you guessed from the name of this section that I don't like Julia Roberts. I'm not really going to get into why, since I imagine there will be plenty of that in the movie reviews themselves, but it really just comes down to the fact that sometimes you've got a huge hate-on for a celeb, and she's one of mine. You know the real reason I'm following the gay romance movies with Julia Roberts movies? It's because if there was ever somebody who stood a chance of turning me off of women, it's her. Now, unless you think I'm all negativity tonight, I'm going to tell you something that I love. I love Netflix. As much as I hate Julia Roberts, that's how much I love Netflix. I love Netflix so much that I wanna take it behind the middle school and get it pregnant (to steal a joke from 30 Rock). Ah, but who can disappoint you most? Say it with me: the ones who you love. I knew nothing about Something to Talk About, aside from the fact that it starred J.Ro., but I added it to my Project Valentine line-up because Netflix had it categorized as a romantic comedy. Really, it's a "romantic" "comedy." No, it's not even really that - I just wanted to make my little quotation marks joke. This movie was neither romantic nor a comedy. Lest you think I'm exaggerating, I challenge anybody who has seen this movie to point out exactly one romantic scene to me. I'll bet the closest you can come is probably the one where Roberts's character reminisces about losing her virginity, and then the dude she's with makes a move on her, and then they both decide not to take it any further. Even that scene could only be called romantic if you stretch; it's mostly just awkward and depressing. There's no romance in this movie, but more on that in a minute. There's also not really any comedy. I mean, sure, there's some broad comedy (Ha! Did you see her kick that guy in the nuts?! Whoa! She food poisoned her husband on purpose! Wacky! ), but what the filmmakers intended for viewers to take as comedy was mostly just awful people treating each other horribly. Watch the movie's trailer in your DVD extra features, and it contains literally every single "laugh" moment in the movie. The trailer at least has the benefit of editing and background music to punctuate the laughs and let you know they're supposed to be funny. The movie itself presents these as dramatic moments, though, which just leaves you feeling kind of uncomfortable and strange when you watch it. Having watched the trailer, though, I guess that I can't blame Netflix for categorizing this as a rom-com. That's how it was marketed, and that's even how IMDB lists it. Here's the truth about Something to Talk About: it is a movie about relationships falling apart. 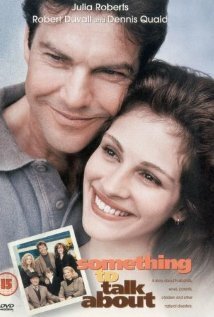 The central relationship is the one played by Julia Roberts and Dennis Quaid, but you've also got a longtime marriage falling apart (Roberts's parents), parent-child relationships falling apart (Roberts and her dad, Roberts and her daughter), and friendships falling apart (Roberts and pretty much every member of the women's charity league that she's a member of). Like I said earlier, no romance. And why are all these relationships falling apart? Like I also said earlier, because they're all awful people treating each other horribly. Husbands cheat on wives, parents belittle children (that is, when they can be bothered to remember they exist), employers needlessly berate employees, friends sleep with other friends' husbands, wives withhold affection and intentionally put their husbands in the hospital, and on and on and on. Seriously, there is not one likable character in this thing, including the kid. Hell, especially the whiny, horribly-accented kid. I've come all this way without even really telling you what the movie's about. There's a married couple with a kid, the husband cheats, the wife leaves him and makes a big scene about it, people ride horses, and they decide to have a peaceful divorce for the sake of their kid. The end. Now you don't have to see it. RATING - I give this movie one horse face out of five. Not because there's horses in it, because Julia Roberts is in it. LESSON - Address the problems in your relationship, don't let them fester until they are beyond repair. Also, avoid exposure to awful people who treat others horribly. It's a matter of timing and context, I suppose, but I saw this movie when it came out with a girlfriend I was mad for, but our relationship was on the brink. It seemed prescient. You know, in that way when you're emotionally raw everything seems like a sign. It looks like Dennis Quaid in the movie with her...maybe not, it also looks like Danny Moder and I don't really know. Julia Roberts was probably highly overrated and hit Hollywood at a time when 'idol worship' of new actresses was the rage. Maybe that's why: Many times, new actresses whether they have the X-factor or not are just lucky, unlucky in the popularity circle and they travel around the pentagram in all the right circles...I've liked Julia in her movies that I viewed however got tired of watching both herself and Tom Hanks, too...It was time for some of the newcomers to make their debut: Like J-Law, etc. Hunger Games. Remember when Marisa Tomei won that "Jersey Girl" movie about "My Cousin Vinny" big award for a wise-cracking, lip-smacking part: Just like the Silver Linings Playbook. They were discovered for their own sexuality at last: They got their in to be made over as Hollywood's Icon/Idols.